Balm is a perennial plant; the stem is upright, hairy, quadrangular, and branched and grows as high as 3 feet. The leaves are opposite, ovate, long-petioled, somewhat hairy, bluntly serrate, and acuminate. The bilabiate flowers grow in axillary clusters and may vary in color from pale yellow to rose colored or blue-white. The flowering time is July and August. When bruised, the whole plant smells like lemon. 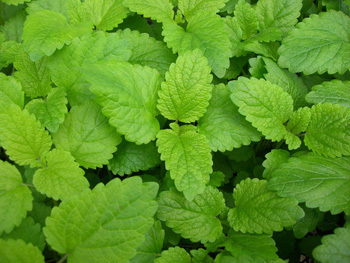 The leaves of this plant, similar in appearance to those of Catnip, are best identified by the strong, pleasant lemony scent. Common in the Mediterranean area and the Near East but is also naturalized to some places in the United States. Mostly, it is cultivated as a culinary herb, but it grows wild in fields, barnyards, old house sites, open woods, gardens and along roadsides, from Maine to Florida and west to Kansas. The great Paracelsus called this herb the elixir of life, and combined it with carbonate of potash in a mixture known as Primum Ens Melissae. It is recorded that one of Louis XIV’s physicians, Lesebure, tried this out on an elderly chicken, which within a few days lost its tattered plumage, grew fresh feathers and started to lay eggs again. He had earlier tried it, with equally dramatic results, on two old servants, but did not complete the experiment. Another of Paracelsus’s elixirs, the Primum Ens Sanquinis, contained human blood and Alcahest, a universal medicine based on caustic lime, alcohol and carbonate of potash. Eau de Carmes, a fashionable 17th century perfume, was a distillation of balm leaves and spirits of wine, to which were added lemon peel, nutmeg, cloves and cinnamon. Balm oil is still a favorite scent throughout the Middle East. The botanical name melissa is from the Greek word for honey. Bees are particularly fond of this plant. Among the ancient Greeks it was a practice to place sprigs of balm in bee hives to attract a swarm. John Hussey of Sydenham, England, who lived to the age of 116, breakfasted for 50 years on balm tea sweetened with honey, and the herb teas were the usual breakfasts of Llewelyn, Prince of Glamorgan, who lived to 108. Other amazing powers of longevity have been ascribed to lemon balm. Essential oil: the concentrated essence of lemon balm has the same properties as the leaves but is far more potent; a few drops make an excellent antidote to depression. Pure essential oil is difficult to obtain commercially; it is often adulterated with lemon or lemongrass oils. Balm is a remedy for common female complaints and is useful for all sorts of nervous problems, hysteria, melancholy, and insomnia. Use balm tea to relieve cramps, dyspepsia, flatulence, colic, liver, spleen, bladder troubles, chronic bronchial catarrh, and some forms of asthma. Try it also for migraine and toothache, and, during pregnancy, for headaches, tension, and dizziness. The warm infusion has diaphoretic effects. An infusion of the leaves added to bath water is also said to promote the onset of menstruation. It is a cooling drink for feverish colds fever, and flu. Use the crushed leaves as a poultice for sores, tumors, swellings, milk-knots, and insect bites. Balm promotes sweating, and is a valuable stand-by when fever is present. Balm is also used in herb pillows because of its agreeable odor. Experimentally, hot-water extracts have been shown strongly antiviral for Newcastle disease, herpes, mumps; also antibacterial, antihistaminic, antispasmodic, and anti-oxidant. Collect the plant before or after flowering. The fresh plant is more effective than the dried. Infusion: use 2 tsp. chopped herb or leaves to 1 cup boiling water. Drink warm, as required. Cold extract: use 2 tbsp. per cup of cold water; let stand 8 hours. Extract: mix 1/2 to 1 tsp. of extract in 1 cup water, take up to 3 times daily. Use the dried herb to make tea, or drink 1 cup of packaged tea daily. Tincture: the dose is 1/2 to 1 tsp. Powder: take 10-40 grains at a time. Sold in commercial antiviral preparations in Germany. This herb is widely available in tea, dried herb, and extract.